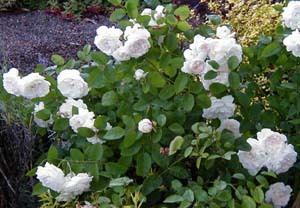 Joy Creek Photo Archive (c) all rights reserved Rosa 'Boule de Neige' (Lacharme, 1867) is a very fragrant repeat bloomer with dark foliage of good substance. The white flowers form gorgeous snowballs, which is what their French name means. A classic. Spring to autumn. 5 ft. x 4 ft. Roses from Joy Creek Nursery are grown on their own roots.